Kenya National Bureau of Statistics hereby releases Consumer Price Indices (CPI) and rates of inflation for June, 2017. These numbers have been generated using data collected during the second and third weeks of the month under review. The prices were obtained from selected retail outlets in 25 data collection zones which are located in Nairobi and in 13 other urban centers. The CPI decreased by 1.2 per cent from 187.64 in May to 185.39 in June 2017. The overall year on year inflation was 9.21 per cent in June 2017. In the first quarter of 2017, the current account deficit more than doubled to KSh 123.2 billion from KSh 43.4 billion in the first quarter of 2016 as shown in Table 1. International merchandise trade which includes exports and imports of goods registered a deficit of KSh 259.6 billion in the quarter under review, an increase of 67.3 per cent from a deficit of KSh 155.2billion in the first quarter of 2016. This was mainly on account of a decline of 2.3 per cent in exports to KSh 152.0 billion and an increase of 32.4 per cent in imports on f.o.b basis to KSh 411.6 billion in the first quarter of 2017.
International trade in services posted a surplus of KSh 50.9 billion in the quarter under review compared to a surplus of KSh 38.1 billion in the corresponding quarter of 2016. Service receipts increased by 18.9 per cent to KSh 131.7 billion while service payments increased by 11.3 per cent to KSh 80.9billion in the first quarter of 2017. The expansion in the service receipts could be attributed to increased travel inflows following improved tourism arrivals in the quarter under review. Diaspora remittances increased by 5.5 per cent to KSh 45.1 billion in the first quarter of 2017 from KSh 42.8 billion in the first quarter of 2016. 1.2. Net financial inflows more than doubled from a surplus of KSh 133.1billion in the first quarter of 2016 to a surplus of KSh 288.0 billion in the first quarter of 2017. This was mainly on account of increased disbursements to the general Government in form of project and commercial loans during the quarter under review. Gross official reserves increased by 8.9 per cent from KSh 792.4 billion as at the end of first quarter of 2016 to KSh 863.0 billion as at the end of the first quarter of 2017. These developments resulted into an improvement in the overall balance of payments position from a surplus of KSh 26.3 billion in the first quarter of 2016 to a surplus of KSh 84.2 billion in the quarter under review. Provisional quarterly GDP estimates for the first quarter of 2017 show that Kenya’s economy expanded by 4.7 per cent measured against a similar period in 2016. The slowdown in growth was largely due to a contraction in the activities of agriculture as well as a deceleration in growth of financial intermediation and electricity supply. The quarter’s growth was negatively impacted on by drought that emanated from failure of the 2016 short rains and delay in the onset of the 2017 long rains. A slowdown in credit uptake also slowed economic growth during the period under review. There was a moderate buildup in inflationary pressures mainly due to significant increases in prices of food and beverages during the period under review. In addition, a 62.2 per cent increase in the international oil prices during the quarter compared to the same quarter of 2016 led a notable rise in transport Consumer Price Index (CPI) component in the months of February and March. Consequently, inflation averaged at 8.8 per cent thereby overshooting the Central Bank’s upper limit of 7.5 per cent. On the other hand, key macroeconomic indicators remained largely stable and therefore supportive of growth throughout the period. Interest rates dropped significantly reflecting the impact of the capping that became effective in September 2016. In the money market, the Kenyan Shilling strengthened against most of its major trading currencies. The most notable gain was a 12.1 per cent strengthening against the Pound Sterling. However, the Shilling weakened against the South African Rand, Yen and US Dollar during review period. A number of key sectors recorded improved growths with that of accommodation and food services being the highest at 15.8 per cent from 10.4 per cent during the first quarter of 2016. Other major sectors whose growths improved significantly include; Wholesale and Retail trade; Real estate; Transport and Storage; and Information and Communication. Agriculture recorded the first contraction in gross value added since 2009 which was attributable to unfavourable weather conditions during the last quarter of 2016 and the first quarter of 2017. Electricity supply was also adversely impacted on by the shortage of rains resulting to slowed growth during the quarter under review. Finance and insurance sector’s growth slowed primarily on account of commercial bank’s reduced lending to the private sector. Figure 1 depicts the first quarter growths for the last 5 years. The findings contained in that report are based on small area estimation methodology using the 2005/06 Kenya Integrated Household Budget Survey (KIHBS) and the 2009 Kenya Population and Housing Census (KPHC). The Report was aimed at presenting the information at the County, Constituency and Ward levels. The findings therefore are actually not new. In an effort to update the 2005/06 information, KNBS conducted a year-long survey, the 2015/16 KIHBS from September 2015 to August 2016. This is the most current household based survey with information on standard of living (well-being) and will provide precise estimates at the national and county levels. Data analysis and report writing is ongoing. The results will be released soon and will give the most current poverty estimates. In addition, the 2015/16 KIHBS will also provide updated information on education, employment, health and other socio-economic indicators for households and individuals. We would like to thank the general public for the continued use of KNBS products and services. We will always endeavor to keep you informed and practice an open door policy as pertains to official statistical information. The Sustainable Development Goals (SDGs) places premium on Agriculture, specifically Goal 2: which aims to end hunger and all forms of malnutrition by the year 2030. It also commits to universal access to safe, nutritious and sufficient food at all times of the year. 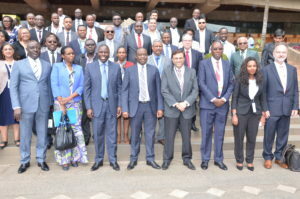 This was said today by Kenya National Bureau of Statistics Director General Mr. Zachary Mwangi, who read a speech on behalf of Devolution and Planning Cabinet Secretary, Hon Mwangi Kiunjuri, during the official opening of the Ministerial Conference on Open Data and Nutrition and the 4th Agritec Africa International Exhibition, at the Kenyatta International Convention Centre, KICC. Mr. Mwangi said the 2030 Agenda recognizes the need to use data for decision making underscoring the importance of quality, accessible, timely and reliable disaggregated data to help with the measurement of progress and to ensure no one is left behind. He said that member States have recognized the crucial role of increased support for strengthening data collection and capacity building, and committed to addressing the data gaps for the targets of the 2030 Agenda. These data gaps are especially pronounced in Agriculture, as a majority of our countries in the developing world have not carried out Agricultural Census in the last ten years, suffer from low investments in agricultural statistics and capacity. This is further compounded by lack of coordination within national data ecosystems. He noted that Agricultural and Rural Statistics (ARS) are not integrated into the National Statistical System (NSS), in most countries. “Data produced by different ministries, departments and agencies and in some cases decentralized systems is difficult to coordinate since they lack standards and are of poor quality. There is duplication of work and conflicting data as a result, dis-incentivizing policy makers who need data to make decisions”. The Director General however said that the adoption of the Global Strategy (GS) for improving Agricultural and Rural Statistics in 2010 will help address the decline in quantity and quality of agricultural statistics in many countries across the world. He also added that the adoption of the Action Plan for Africa on the Global Strategy has encouraged many developing countries to come up with Strategic Plans for Agriculture and Rural Statistics (SPARS) which are to be integrated into the respective National Strategy for the Development of Statistics (NSDS). Mr Mwangi concluded by saying, “Global Open Data for Agriculture and Nutrition (GODAN) is one of those partnerships that truly reflects this multi-stakeholder ecosystem in support of developing countries”. The County Statistical Abstract, is a publication by Kenya National Bureau of Statistics. It is the first of its kind to be developed for all the 47 counties in the County, and will subsequently be produced annually. The County Statistical Abstract highlights key statistical indicators at the County level. The Abstract will be a single source of information covering various sectors of the economy at the county level. The Abstract has substantially benefited from the administrative data generated in the counties. It is expected to provide a reliable source of information for planning, policy formulation, monitoring and evaluation processes. The data contained in this Abstract will, therefore, enable data users to gauge the performance of the counties. The Leading Economic Indicators highlights trends in Consumer Price Indices (CPI) and inflation, interest rates, exchange rates, international trade, agriculture, energy, manufacturing, building and construction, tourism and transport. Consumer Price Index (CPI) increased from 182.98 points in March 2017 to 186.24 points in April 2017. The overall rate of inflation rose from 10.28 per cent to 11.48 per cent during the same period. In March 2017, the Kenyan Shilling depreciated against the major trading currencies except for the South African Rand and the Ugandan shilling. The average yield rate for the 91-day Treasury bills, which is a benchmark for the general trend of interest rates, increased from 8.68 per cent in March 2017 to 8.77 per cent in April 2017 while the inter-bank rate rose from 4.46 in March 2017 to 5.31 per cent in April 2017. The Nairobi Securities Exchange (NSE) 20 share index increased from 3,112 points in March 2017 to 3,158 points in April 2017, while the total number of shares traded decreased from 636 million shares to 446 million shares during the same period. The total value of NSE shares traded decreased from KSh 12.46 billion in March 2017 to KSh 11.41 billion in April 2017. Broad money supply (M3), a key indicator for monetary policy formulation, expanded from KSh 2,767.89 billion in February 2017 to KSh 2,832.73 billion in March 2017. Gross Foreign Exchange Reserves expanded from KSh 1,087.83 billion in March 2017 to KSh 1,158.09 billion in April 2017. Net Foreign Exchange Reserves increased from KSh 604.95 billion in March 2017 to KSh 678.95 billion in April 2017.